LJ, 4, has been "writing" her name for some time now. The letters she write though are all jumbled up and some are upside down. This is, apparently, a completely normal stage of literacy development. And as Germany has a very relaxed attitude towards literacy, it has not evolved much. One of my goal for her summer break is to try and change that. 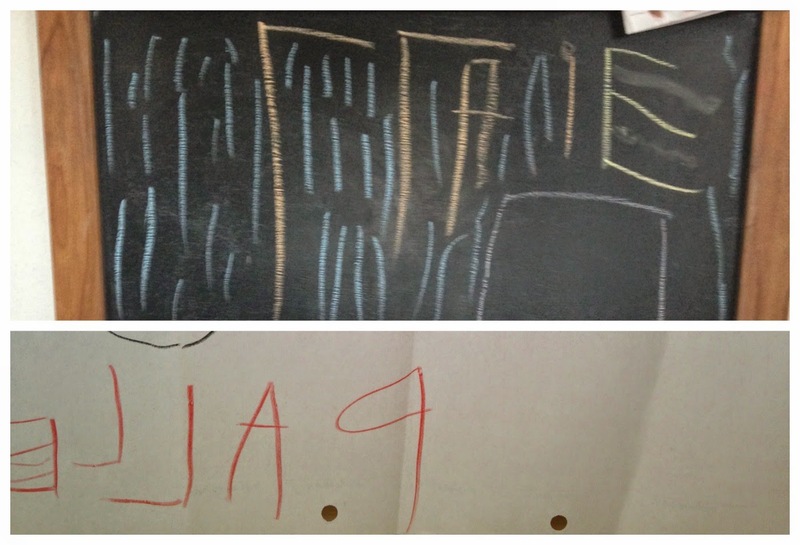 In kindergarten, LJ has not, so far, learnt to write her name. Germany has a very relaxed attitude towards literacy before 6 years old. 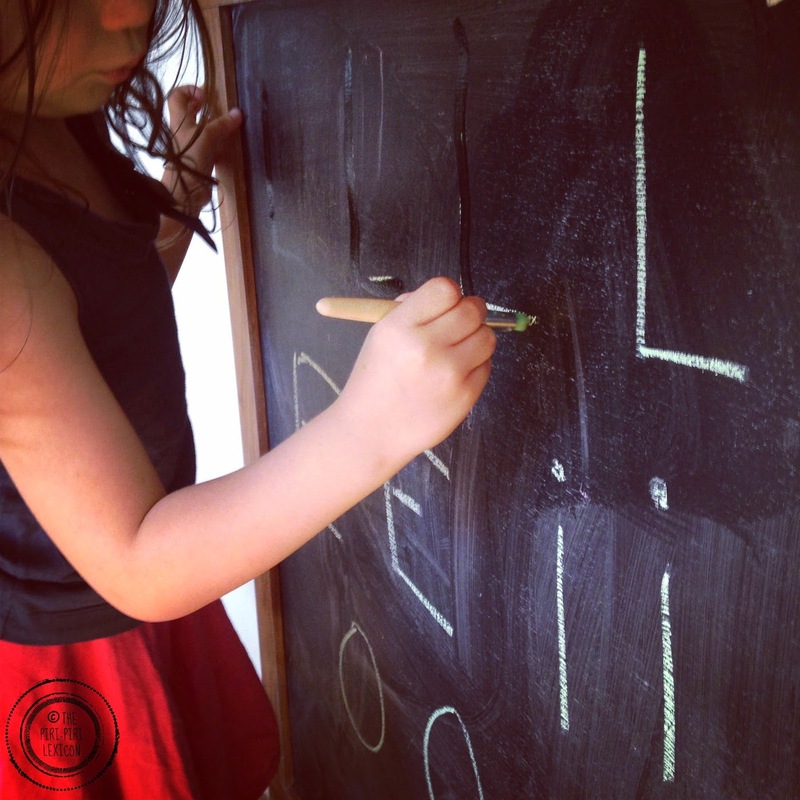 In kindergarten, children are encouraged to play and learn that way. Literacy is not at the forefront of preoccupations. That suits me fine. I think they have plenty of time to learn to read and write later. the 'l's are upside down on the top picture and all are reversed on the bottom picture, where the 'e' also has too many lines. Her letters are quite irregular. Some days they are perfect, others not. So I made it my goal to try and work on this with her. The problem is that she is quite reluctant and whenever I try she claims she cannot do it. We have plenty of worksheets where you have to draw the letters. On most of these the letters are represented with little dots and the child has to draw over them. She refuses to do those so far. Enters Pinterest. 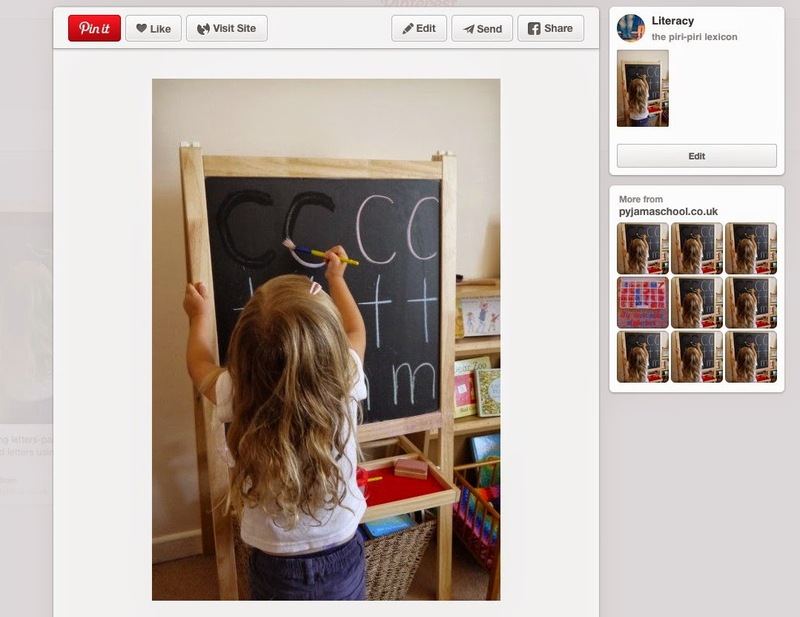 I saw this pin from Pyjama School about using a paintbrush to cover letters on a board. I knew she would like this. And I was right, playing with the wet brush on the board was a success. She drew/wrote over the letters over and over again. Even now, as I type this up, she is behind me, doing it all over again! Let's just hope it helps. 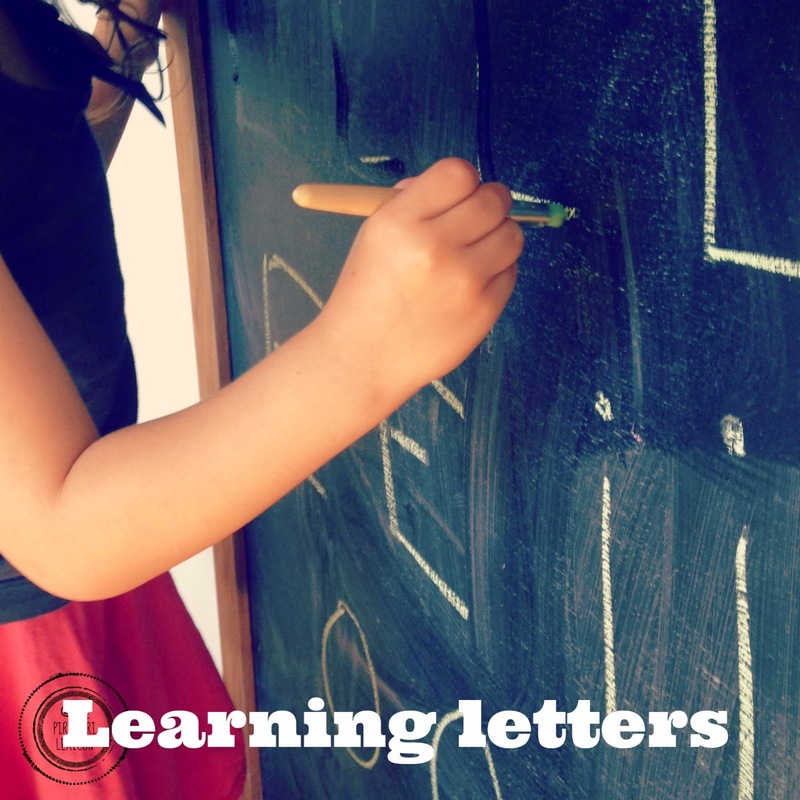 Have you got any other tricks that could help with letter formation? I'd love to hear them. I used to write numbers backwards - 5s and 3s. We were taught to remember which why 5s went with a saying "a hat and a back and a big fat belly" - that way we knew the curve had to go in front of (i.e. to the right of) the straight back. I wonder if you could find something similar for letters? The blackboard paint out sounds like a great idea for pencil/brush control. My 3-year old already spends ages drawing on the tiles only to rub it all out with her finger so this could be a cleaner, more useful activity! I think turning letters into pictures could help. 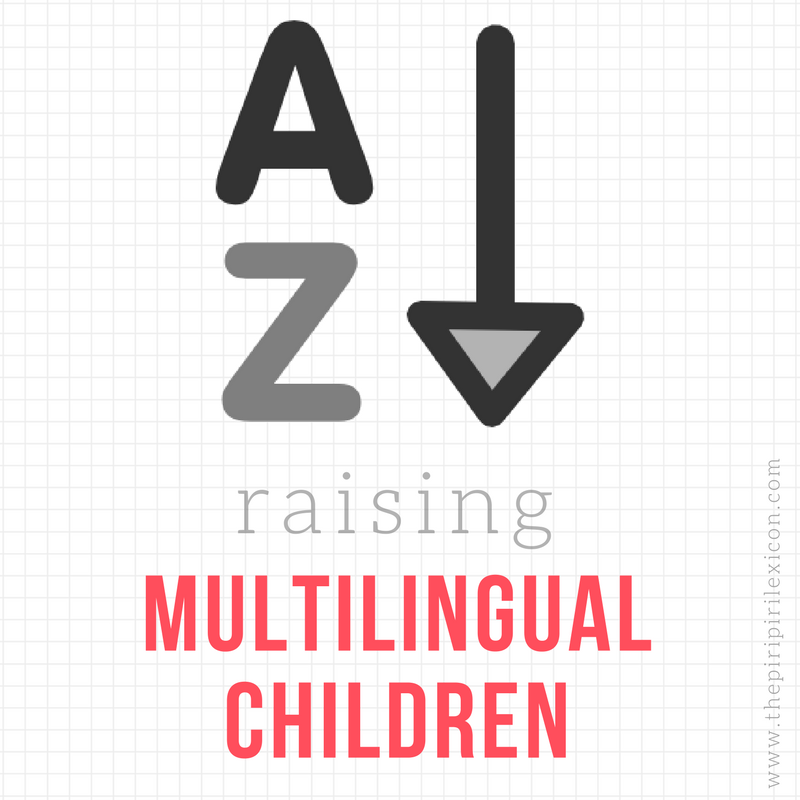 Starting from the top left is an ingrained habit for us adults but has no special logic for a child - why not start from some other point, or indeed write backwards?